North West Ridge 112 - Timber Wolf Lodge Ski Chalet. Adjacent to the Western Territory Slopes. Free Shuttle to Village . Expansive covered 40' decks with amazing views, hot tub, wood fireplace, spacious bedrooms with two separate master suites, short walk to Cupp Run (black diamond slope). On a clear day you can almost see forever from the decks of this gorgeous, beautifully furnished and quality-built home. The home is situated on Snowshoe's stunning "Western Territory" which allows you to see amazing sunsets after your full day on the slopes. Timber Wolf Lodge is a luxury 4-bedroom, 3.5 bath retreat that is a two-minute walk to Cupp Run, the black diamond slope designed by the legendary Olympian Jean-Claude Killy that features 1,500 feet of vertical drop and spans more than a mile in length. If you're not quite ready for Cupp Run, just give the free shuttle service a call and they will pick you up at the base of Timber Wolf's driveway and take you into the Village Center. 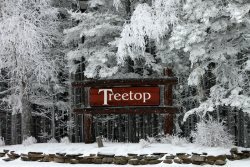 From there, you are free to ski any or all of Snowshoe's 59 other trails. When you're ready to head home, just hop on the free shuttle and it will return you to Timber Wolf Lodge. Timber Wolf Lodge has warm cedar and poplar wood throughout with a 22' ceiling in the living room and dining area. The kitchen is well equipped and will allow you to cook to your heart's content. If grilling is what you have in mind, there is a gas grill on the upper deck. Other features include: five flat screen TVs (the one in the LR is an extra large "smart" TV that will allow you to connect to your existing Netflix or Amazon Video accounts), a bluetooth speaker, large library of DVDs, games, wireless Internet, landline telephone, wood fireplace, ceiling fans, hot tub, bikes for summer & fall riding, ping pong table (in garage), and a hammock on upper deck (for summertime relaxation). There is also a second TV room on the lower level.